The best mid cap sectors are consumer and industrials. The highest scoring mid cap industry is movies. The average mid cap score in our universe is 63.62. Across our mid cap stock universe, the average stock is trading -17.17% below its 52 week high, 8.25% above its 200 dma, has 6.32 days to cover short, and is expected to deliver 16.1% EPS growth next year. 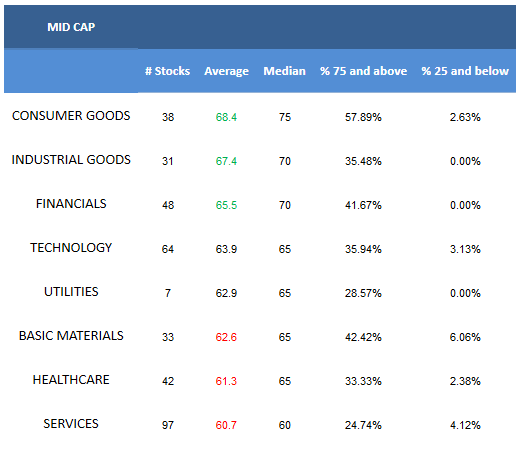 Consumer goods, industrials, and financials score above average in mid cap. 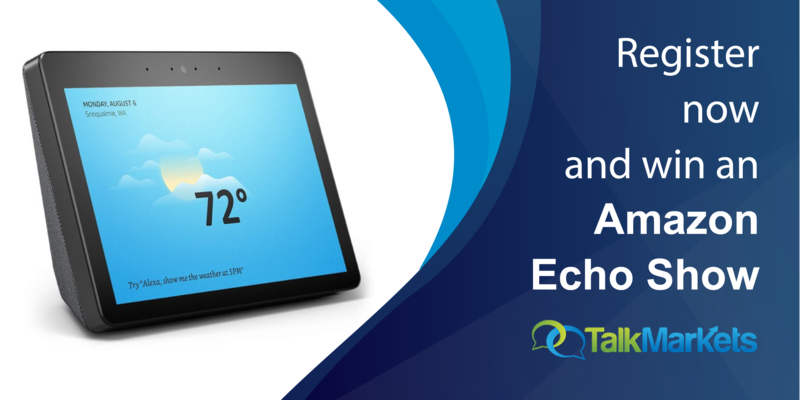 Technology and utilities score in line. Basics, healthcare, and services score below average. In those baskets, remain industry and stock specific. The strongest scoring industry in our mid cap universe is movies (RGC). Industrial electrical (BDC, AOS, LFUS), processed & packaged goods (GIS, HAIN, LNCE), specialty chemicals (NEU), and information & delivery services (FDS, DNB) are also top scoring. In mid cap basics, buy specialty chemicals, steel & iron (STLD, HSC, MT, CRS), and oil & gas equipment & services (HLX, PDS). The best consumer goods industries are processed & packaged goods, packaging & containers (TUP, BMS), and textiles (DECK, CRI, WWW). REITs (WRI, REG, NNN, CLI, BDN), accident & health insurance (AFL, AIZ), and regional banks (HBHC, FFIN, BXS, OZRK) offer upside in financials. Medical appliances (ALGN, MDRX, MASI), healthcare plans (WCG, CNC), and medical instruments (WST, TFX, DXCM) are strongest in healthcare. 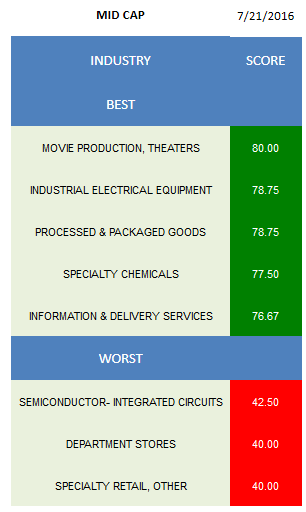 Industrial electrical, aerospace/defense (TDY, CW, CAE), and diversified machinery (MIDD, BGG) are best in industrials. In services, focus on movies and business services. Information & delivery services, technical & system software (TYL, CDNS), and application software (LOCK, FTNT) are high scoring in technology. Gas utilities (EGN, NJR) can also be bought.